Dr. Sheryl Silverstein, born in Atlanta, Georgia, is a graduate of the University of Michigan and the Medical College of Georgia School of Dentistry. After dental school, she completed a general practice residency program at the North Shore-Long Island Jewish Hospital System and was chief resident at he Parker Institute for Health Care and Rehabilitation. Following residency, Dr. Silverstein started an outpatient geriatric dental program at the Parker Institute for Health Care and Rehabilitation and headed the dental treatment center at the Jewish Home and Hospital for the Aged in Manhattan, in addition to holding an attending position in the Department of Geriatric medicine at the Mt. Sinai Hospital. Dr. Silverstein is in private practice, providing comprehensive care to all patients, with a special love for the geriatric, medical compromised patient. She is currently the Vice-Chairman of the Board of Trustees at parker and serves on several other nonprofit board of directors. Dr. Silverstein is active in the New York State and the Nassau County Dental Society where she holds positions of leadership. As an attending at the North Shore-Long Island Jewish Hospital Health System, she works with the dental residents in the department of Dental Medicine. Dr. Silverstein is the proud mother of three grown children. Her hobbies include creating fruit carvings, catering, theater, piano and cycling. Dr. Michael Vinciguerra spent his undergraduate years at Fordham University and then went to Columbia University, School of Dental and Oral Surgery, where he graduated as a member of the Omicron Kappa Upsilon Dental Honorary Society. He spent two years at North Shore University Hospital as a general practice resident and then stayed on as chief resident. After completing his residency, he finished a two year implant fellowship at North Shore University Hospital. Following his fellowship, he became partners with Dr. Sheryl Silverstein in 1998 and has since been in private practice providing comprehensive dental care to his patients. He has a special interest in restorative implant dentistry but enjoys providing all aspects of dental care to his patients. Dr. Vinciguerra is an attending dentist at North Shore-Long Island Jewish Health System. 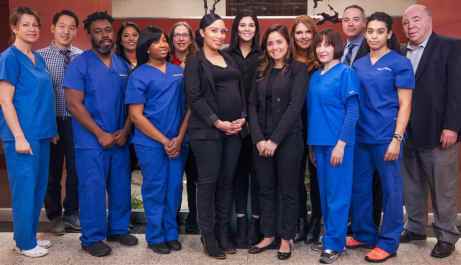 He is also an active member of the Nassau County Dental Society as well as the New York State Dental Association. Dr. Vinciguerra is a proud father of three boys and spends his weekends as their assistant coach for their travel soccer teams.